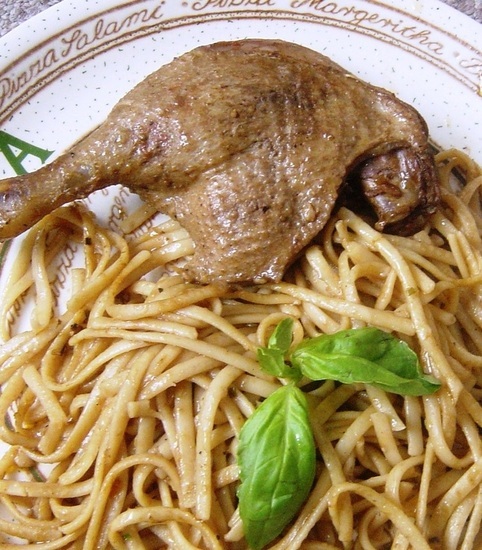 ​I wish I could enjoy pasta with chicken, or simply shrimp, or some sliced pieces of bacon-but I don't. 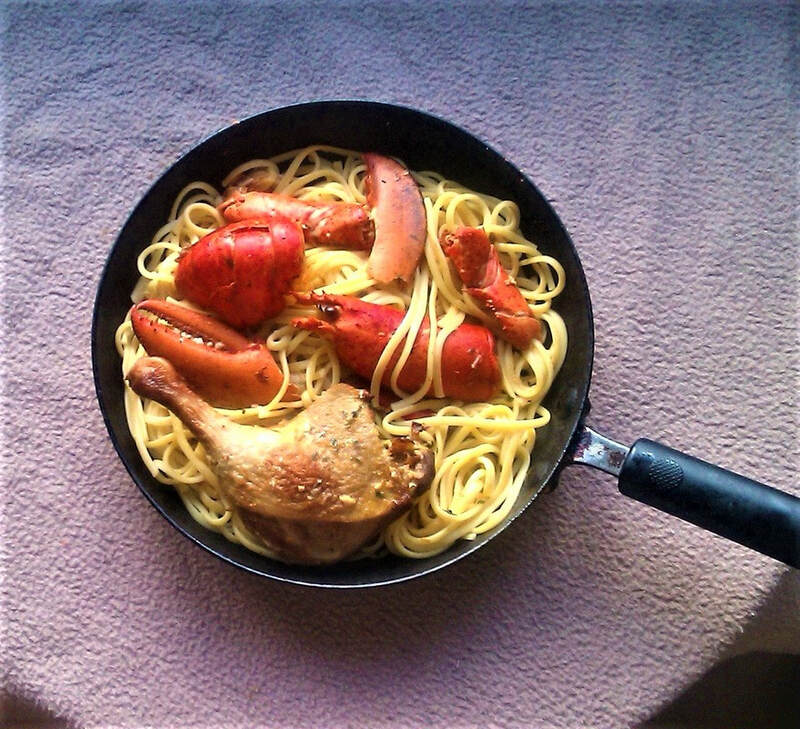 I love linguine with duck and/or lobster. I always eat it with one or the other, this time I decided to pair the two together. And magic happened...magic happens when you prepare your favourite meat; in my case duck, with your favourite seafood-which for me is lobster. As I have already stated throughout various posts, I sometimes crave pasta. In fact I crave it every few weeks. 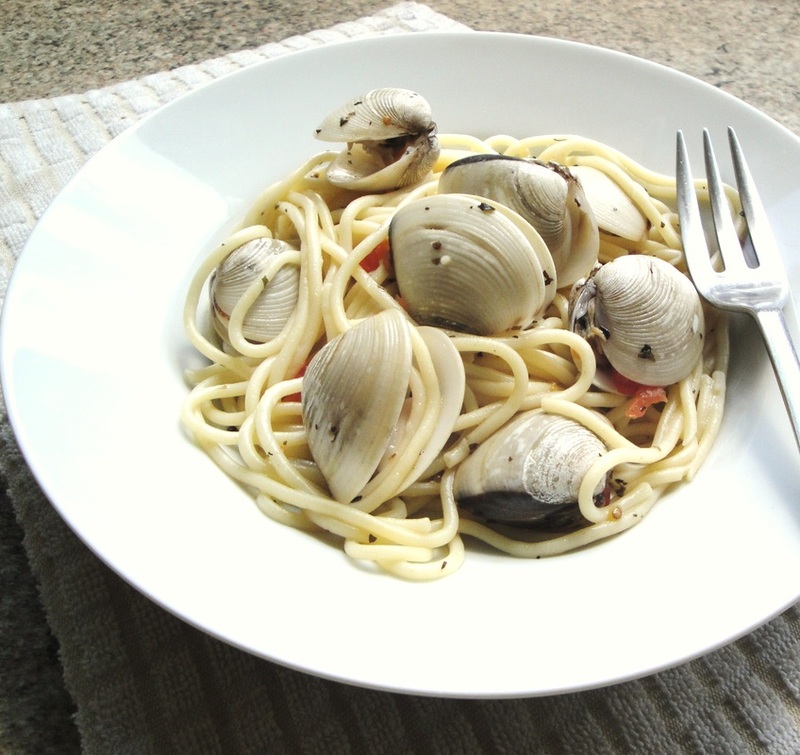 To fulfil this craving I usually prepare Spaghetti or Linguine, they are my favourite pastas. 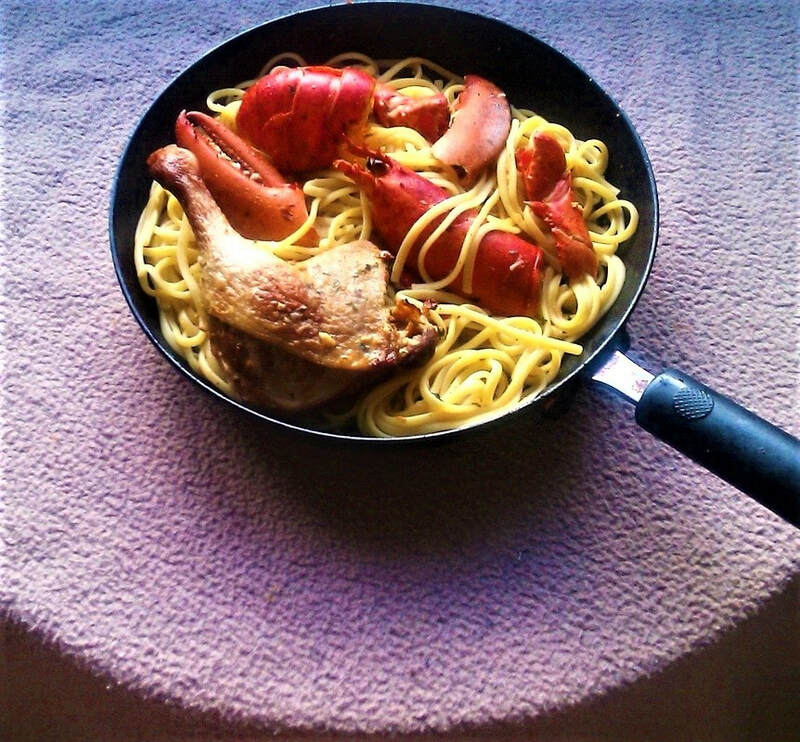 But Linguine is my absolute favourite. My favourite brands are Dececco and Napolina. 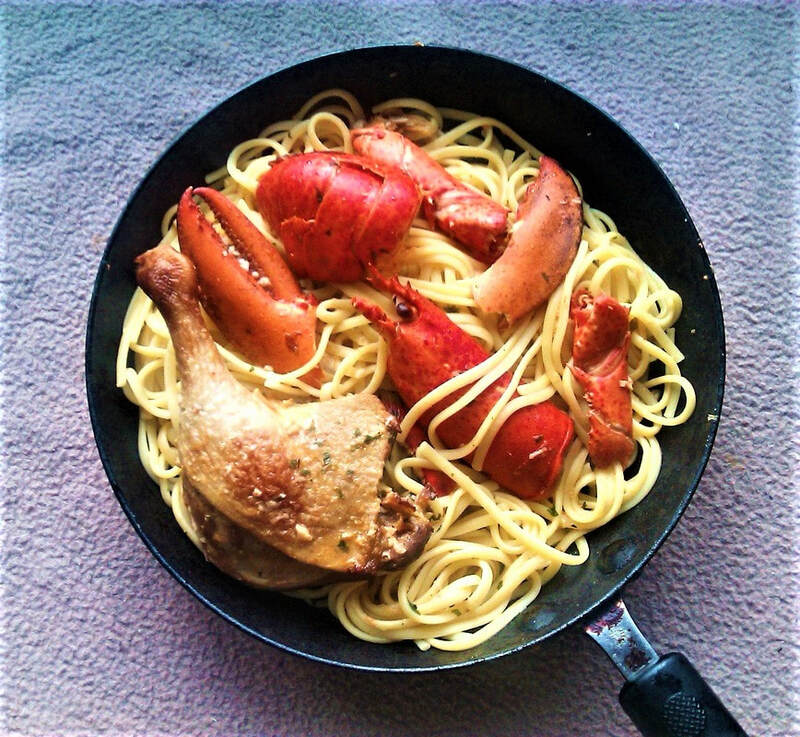 Pasta is so cheap and easy to prepare, of course duck and lobster can be a little on the pricey side to say the least, but you can get good deals. Shrimp and Chicken can be used instead for this recipe. 1. To cook the lobster bring a large pot of water to a boil, and boil for 8 to 10 minutes. Then remove the lobster from the water. 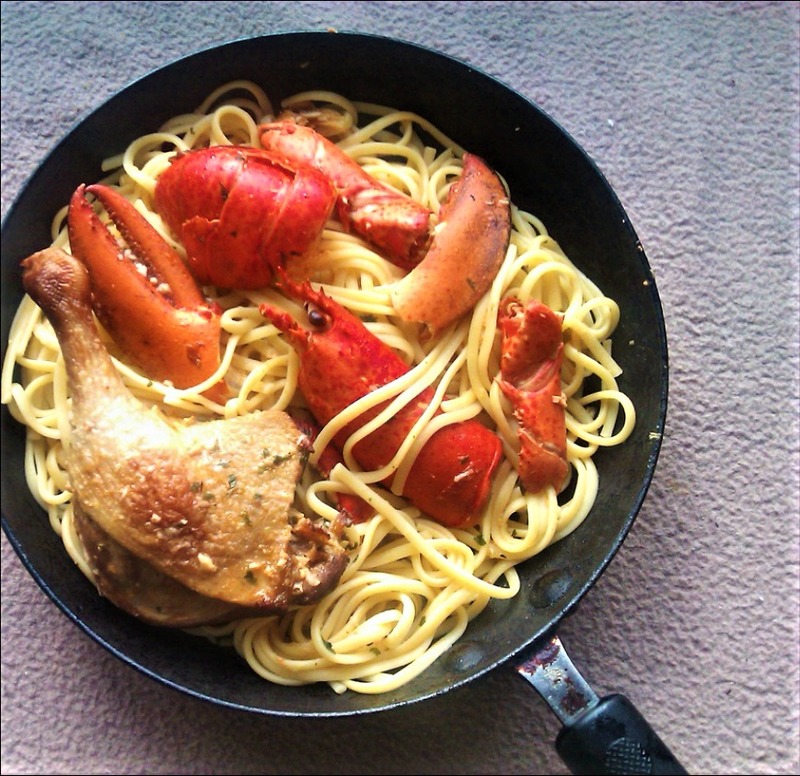 Let it cool a little, then take the lobster apart and remove the brown guk from the head. Video on taking Lobster apart here. 2. 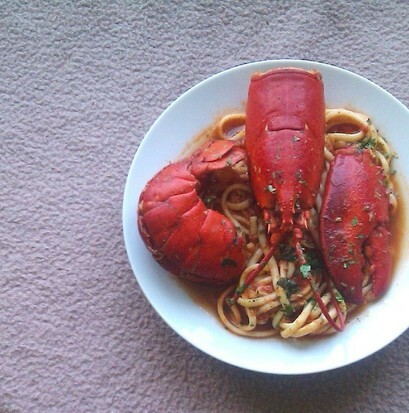 Take parts of the shell of the lobster and remove the meat, to make some of the stock and sauce for the pasta. 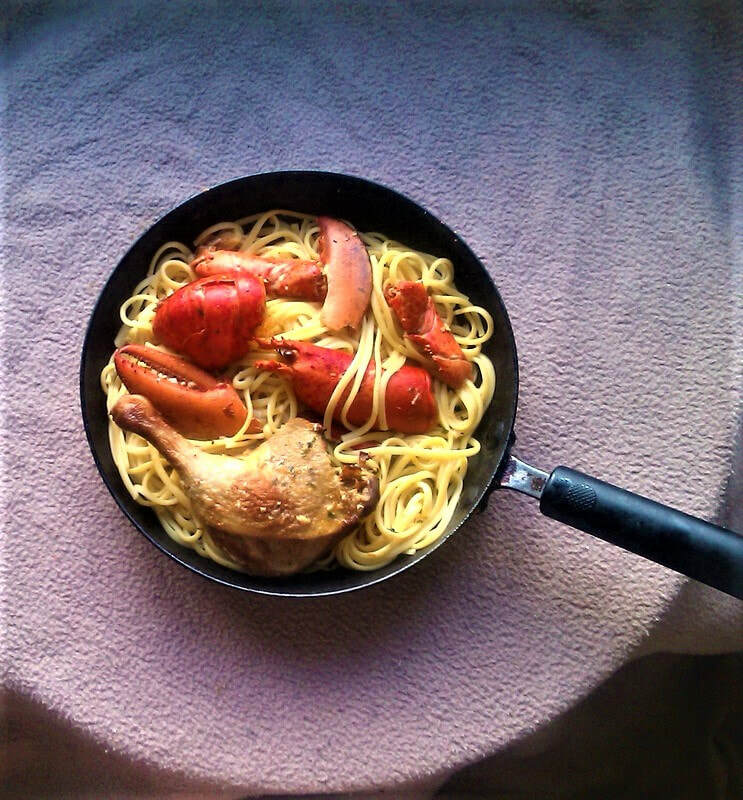 It does not have to be quarter or half of the lobster, just a little. You don't want to overcook the meat! 3. Add about a sprinkling of 1 teaspoon of salt to the duck, and 2 tsp of soy sauce and rub it in, set aside. Then place a wide pot on the stove and turn the stove on high to get it hot quickly. As soon as it's hot enough turn to medium-high and add the oil. Let the oil heat up a little and then brown the duck on both sides for about five minutes, or until brown-sear the duck. 4. 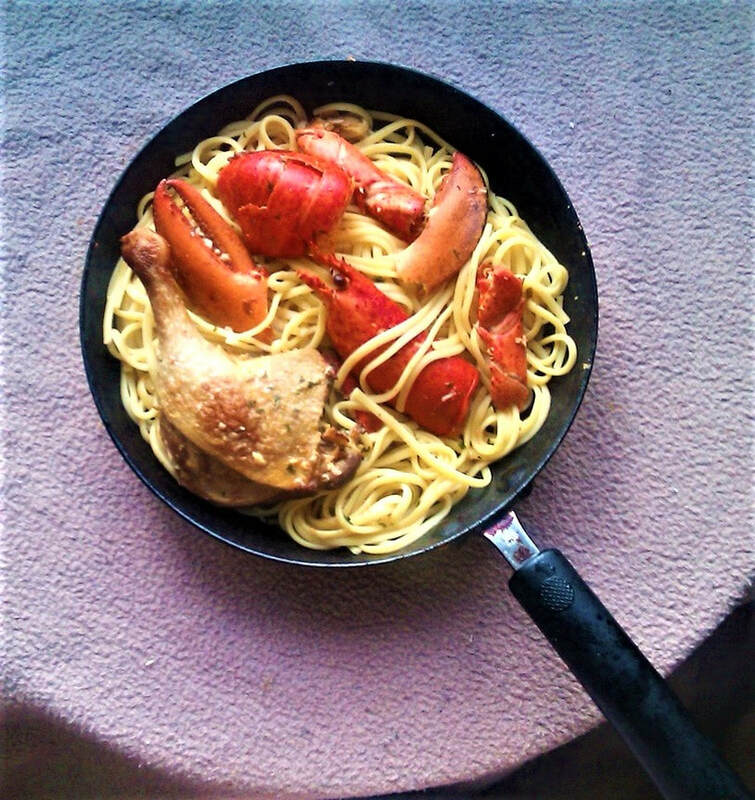 Once the duck is browned, add some of the lobster shells and sear for a few more minutes. Of course is the pot is too high or low, adjust accordingly. 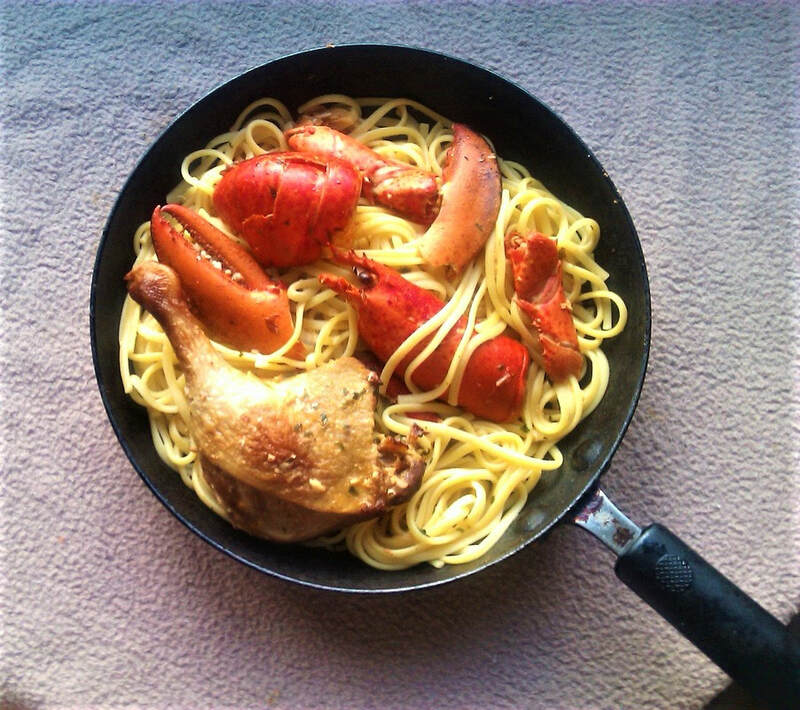 Once that's done remove the duck and lobster shells. Then add the chopped garlic or paste, and chopped onions to the pan and sear them together until they become dark and aromatic. This should take about five to eight minutes. 5. 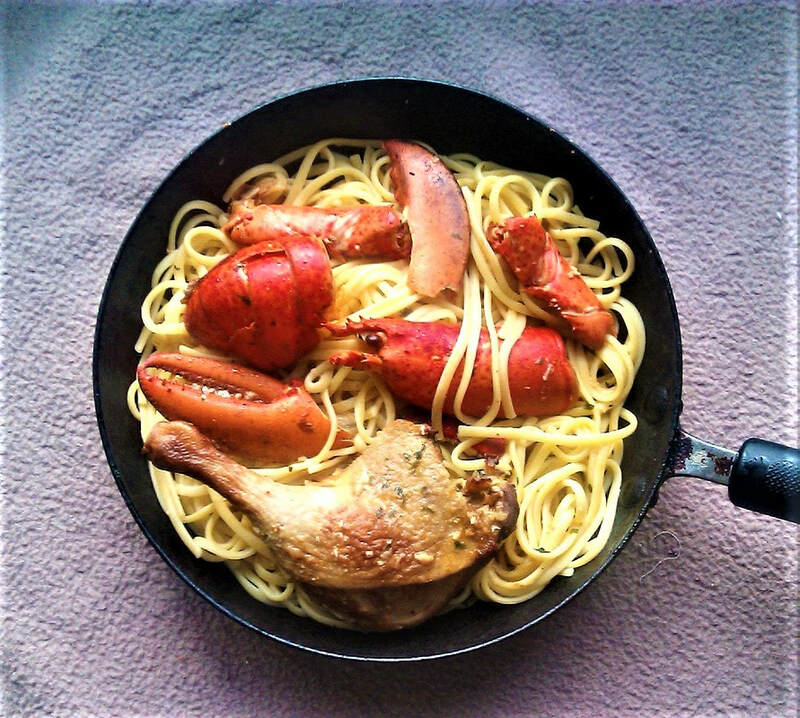 Now add the duck and lobster shells back into the pot and sear together for about a minute or two with the garlic and onions (add more oil if needed) and then add the 4 cups of water with chicken stock cube, or the 4 cups of chicken stock. Then the tomato paste. Stir and boil for about ten minutes. Keep a jug of about a cup of water to the side in case water evaporates significantly. 6. Then turn to a low simmer for about 1 hour to begin with, keep checking on the pot every twenty minutes or so. Then after the hour is up taste for salt and pepper and add according to your taste, make sure to stir when adding ingredients to make sure the ingredients are evenly incorporated. Then add the dried herbs, and simmer for another half an hour. During this time boil the pack of linguine... bring about 8 or 9 cups of water to a boil, once it's boiling add the linguine and sprinkle a generous amount of salt in the pot. 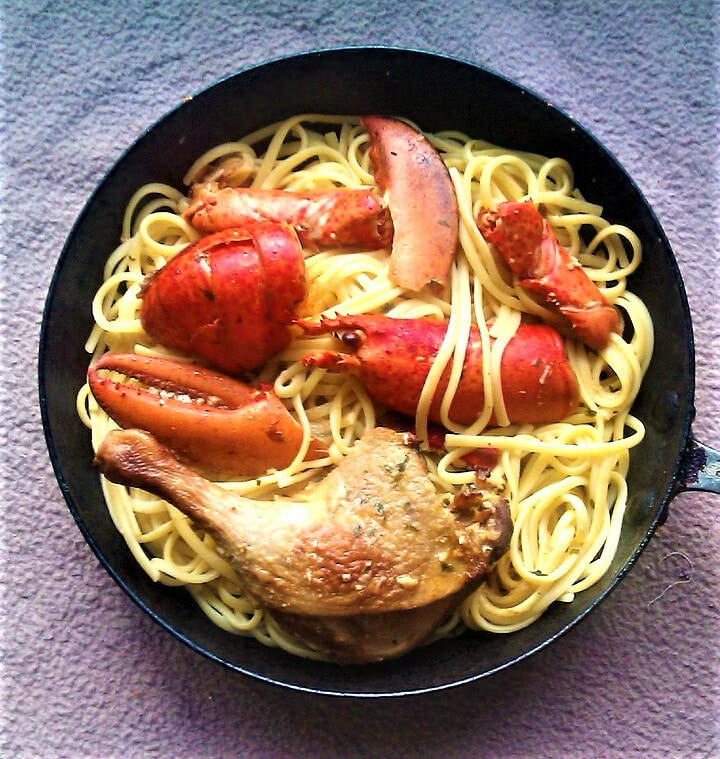 The linguine may be sticking out of the pot until the pasta softens but cover the pot and make sure you push the linguine down into the pot as it softens so the pasta is boiled properly. Boil pasta to your desired softness. 7. Once done, discard most of the pasta water leaving about a quarter cup of water behind in the pot the pasta has cooked in. When the sauce is done, pour it over the pasta.